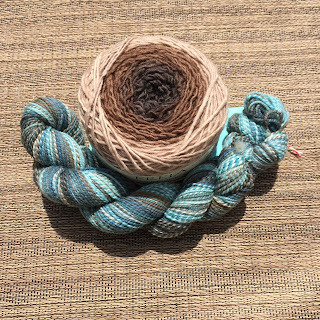 The influx of soft cotton- and linen-blend yarns into the shop over the past few weeks has piqued the interest of many of our customers, and lots of summer-weight projects have already been started. Heck, some of our more dedicated knitters have even FINISHED them already! 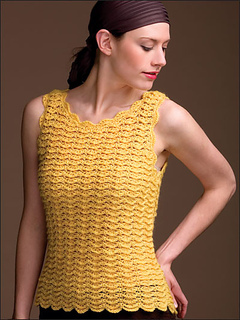 So, friends, what's your favorite crochet pattern for the summertime? I'd love to see it - post a link in the comments so we can all be inspired! It all started with Frank....Frank Ochre that is. .... Malabrigo yarns produced some new colors in their Rasta yarn base; one just happened to be my all-time favorite color, Frank Ochre. As we unpacked the box I swooned and knew I had to have a sweater out of this soft, awesome color. We were meant to be together, Frank and I.... so I searched Ravelry for projects that had used Rasta and found Melissa Schaschwary’s pattern, The Road to Gimmerton. This pattern is a fitted and cropped cardigan with capped sleeves worked from the top down, and most importantly using only 3 to 4 skeins of Rasta. Reading the pattern I was struck by the simplicity of the project that incorporated top down knitting, paired increases and decreases for the shaping and minimal seaming (or none if the sleeves are knit in the round). Even the trim was incorporated into the body knitting, so it didn’t have to be picked up later. I realized it was the perfect pattern for a First Sweater and therefore a class. Before that could happen, though, I knew I should test out the pattern. Frank Ochre came home with me that night, and I tried to finish it before I returned to work the next day. Along the way I decided to re knit the capped sleeves to lengthen them. It was this decision that kept me from getting done in 24 hours and winning my bet with Erika that it would be done by the time I returned to the studio! We had great participation in the class. We realized that it does take longer than 2 hours to get to the armhole shaping(one of the more challenging aspects of the pattern to a new sweater knitter) and had to touch base in my Confidence Building Classes. Since the class, I have knitted Gimmerton twice more (both in Woolfolk Hygge yarn) and have loved having a deliciously cozy sweater that keeps my shoulders and back warm. Because I don't want to overheat, I choose to wear it without a closure. 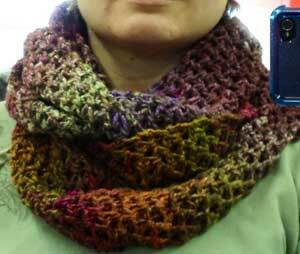 The knitters in the class have proudly worn theirs and all have told me how happy they are with their finished(!) projects. 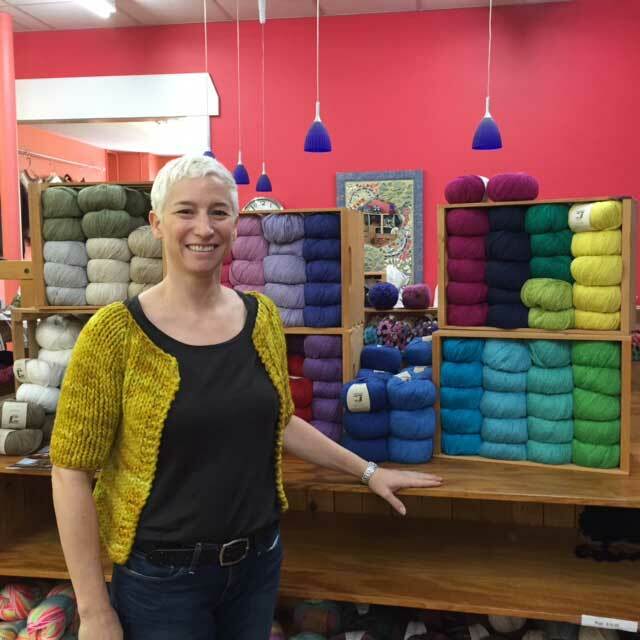 We are offering the class again and I hope, if you’ve been hesitating to take the plunge in to sweater knitting, you will consider taking the road to Gimmerton! P.S. I am happy to say many of the students wanted to start a new sweater. We have ventured into Abria by Bonne Maria Burns and are all using the new Rowan yarn Softyak DK. 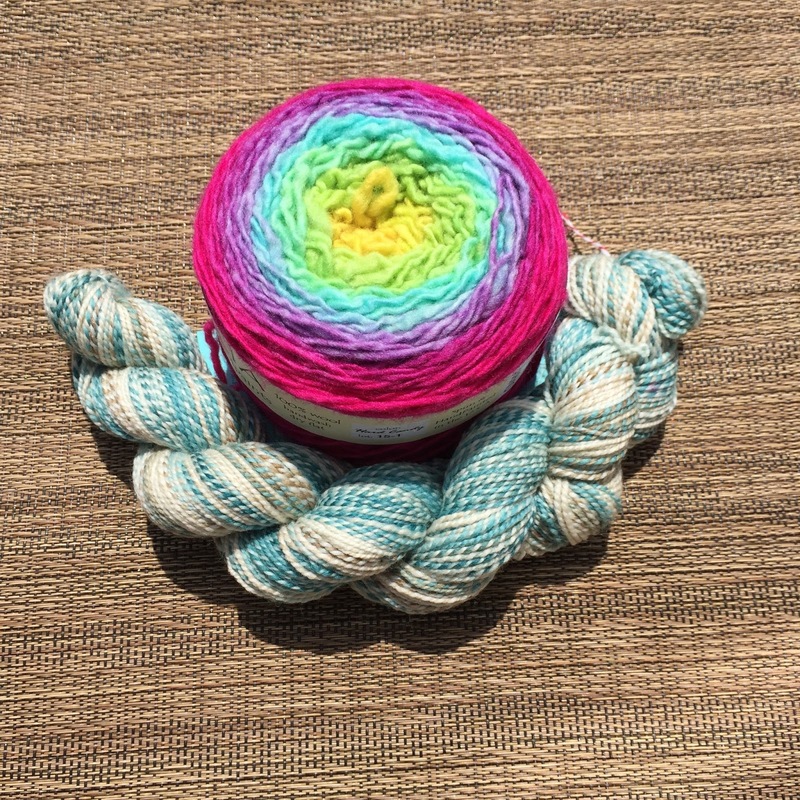 Stashbusting, or, "What do I do with all these little balls of leftover yarn?" 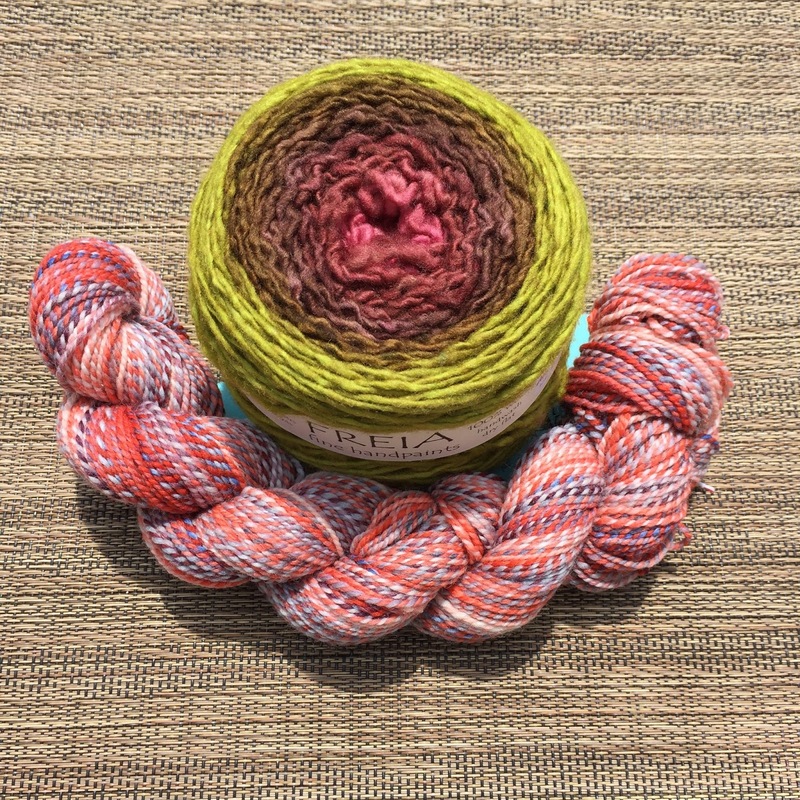 Even if you've gone through and organized your main stash (have you seen how the Yarn Harlot does it? ), it's inevitable that you'll be left with a some orphans. Sure, you can stick them in bowls and use them to decorate your house, but wouldn't it be nice to find a crafty use for them? Embellishments - sew them on a hat or bag, or attach to a pin and use as an accent on many different outfits. Stuffed animals - give them to a child or put them on your desk, they're not just for kids anymore! 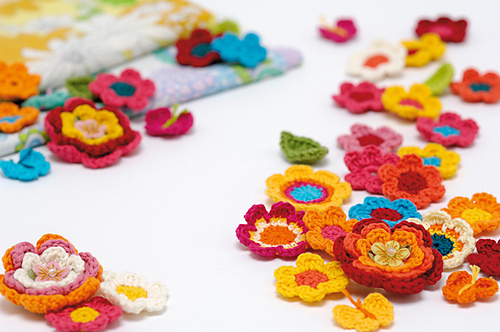 Scrappy afghans - granny squares, stash-busting stripes, and log cabins are all good choices. My obsession started with the yarns in the "grab bags" we had in the shop, and when I ran out of them I moved on to raiding my leftover yarns. Seven shawls and three blankets later, I still love the look of it! 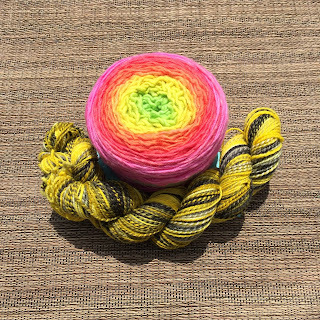 Almost any pattern for worsted weight (or larger) yarn will work, so have fun poking around on Ravelry to find a pattern that looks like fun to you. And by the way ... if you try this technique, don't be afraid to join yarns in the middle of a row. There's a great way to do it almost invisibly called the "magic knot." Check out this tutorial for more information on how to do this crazy-useful technique, which also comes in handy when you're making a lacy fabric where it would be difficult to hide the yarn tails. 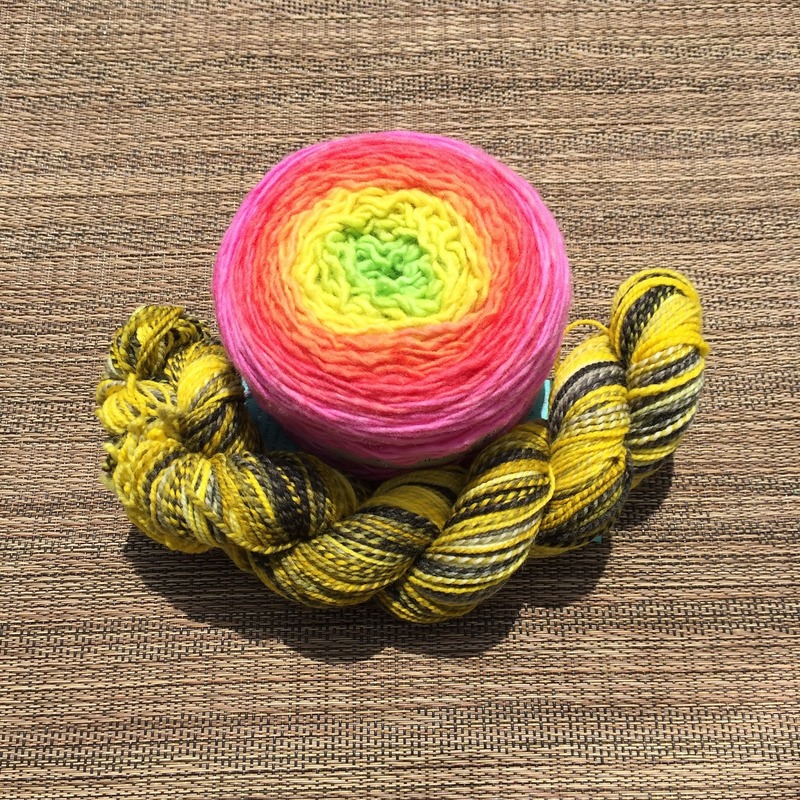 When you find that perfect yarn and pattern pairing, it is like finding the end of a rainbow! That's what happened the moment I saw the finished Clementine cowls that were popping up during our Thursday evening social knit. 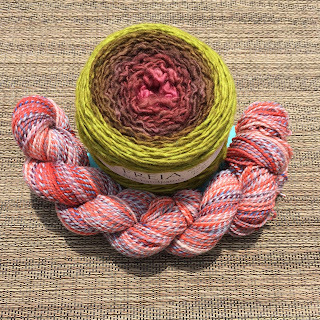 My favorite Clementine FOs were the ones that used 1 skein of Spincycle Yarns Dyed in the Wool and 1 skein of Freia Fibres Handpaints Ombré Sport. The pairing of these two gradient style yarns got to me and I had to cast-on a shop sample right away! The shop sample was actually my second Clementine because I knit one for myself and I just loved the soothing hand work of the slipped stitch patterning. After knitting my first one, I did realize the error in my way of not reading all of the pattern instructions (do as I say, not as I do...). So should you decide to cast one on today, follow the suggestion in the pattern and skip the blocking because it does flatten out the fabulous texture of the polka dot pattern. 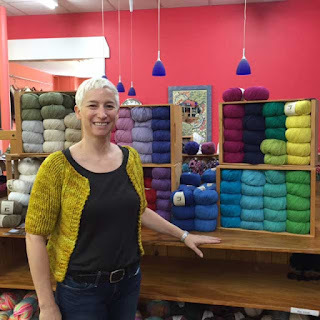 I just recently ran into The SpinCycle Spinsters at the Maryland Sheep and Wool Indie Pop-up shop hosted by The Knot House (a definite must stop if you are in the Frederick, MD area). I might have taken home 1... okay it was actually 3 skeins of their fabulous wool. I snapped a few images for your viewing pleasure. Want to know all more about the Spinsters of Spincycle? Check out Episode 57 of the Woolful Podcast. 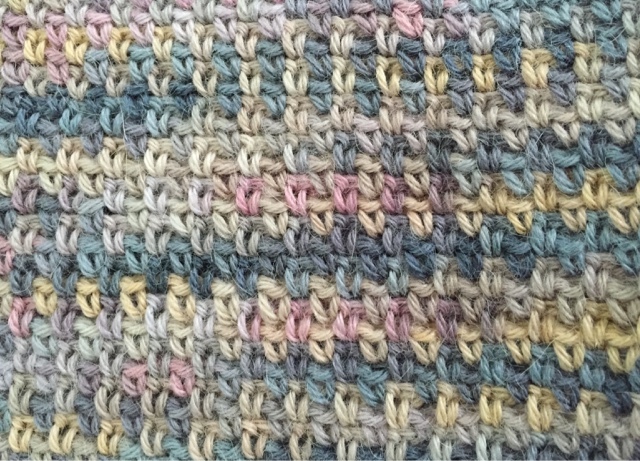 Crochet linen stitch - beautiful, versatile, and EASY! Many customers have been curious about a project I have been working on, a striped cotton baby blanket I designed for my newest nephew. 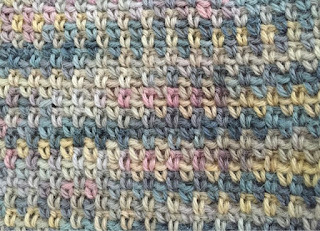 It’s worked in crochet linen stitch (sometimes called moss stitch), which is one of the easiest and most versatile stitches in the craft. It’s basically [single crochet, chain 1] worked into the chain-1 spaces of the previous row. After the first row or two you’ll fall into the rhythm of it - it’s very relaxing to watch the beautiful fabric just flying off your hook! 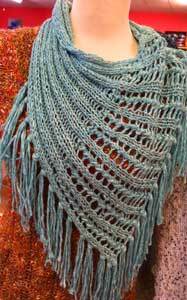 This stitch breaks up pooling in handpainted yarns and gives an interesting texture to solids. 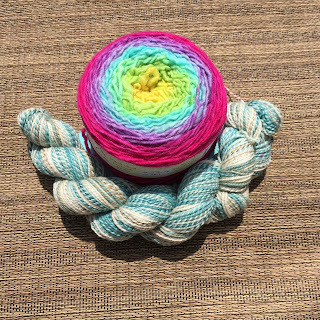 By playing around with color, yarn weight, and hook size, you can get a myriad of different effects with this one simple stitch. 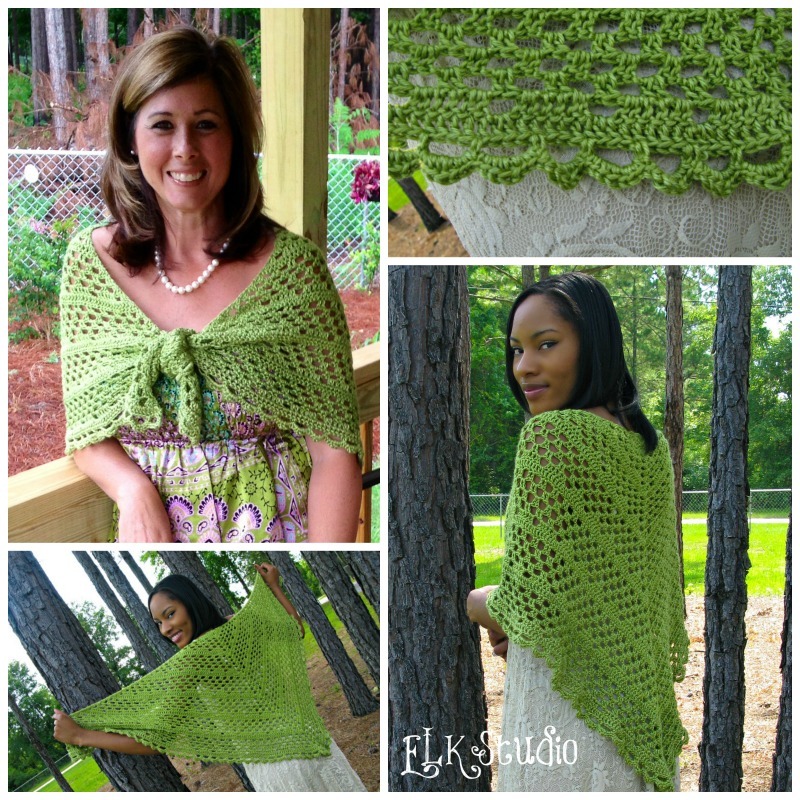 Crochet linen stitch is versatile, beautiful, and easy to master - what are you waiting for? Grab a hook and get stitching! 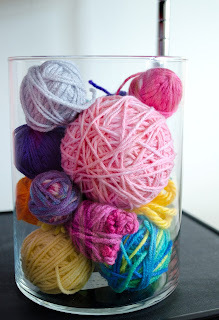 Pick a hook size that is AT LEAST twice the diameter of your yarn. Bigger is better, but don’t go crazy with it. Work a small swatch to make sure you’re happy with the drape of the fabric you’re making. Leaving an 18” tail when you make the slip knot, make chain stitches until this foundation chain is the width of the cowl you want to make (between 6” and 8” is pretty standard, but you can make it wider or narrower). Work the linen stitch back along the foundation row - instructions here. Continue in linen stitch until strip is desired length (or you don’t have enough yarn to complete another row), then cut yarn and secure last stitch. Sew the ends of the strip together with the long tail you left at the beginning. Mattress stitch is often used, but you could whip stitch it or use any other sewing method you like. For a regular loop, join the two ends without a twist. For a Mobius loop, flip one end of the strip once before you join the ends. 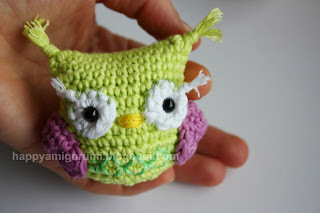 This project can also be worked lengthways with no seam; check out this free pattern for instructions on working the Mobius version in the round. At the studio many of us are fans of the designer Jane Richmond. She recently had a knit along for her Arika cowl and I stumbled into it at the very end. I was reviewing the projects on Ravelry after I found the pattern and most people had done it in some type of wool or alpaca. I decided to break loose and use the yarn Norah by Stacy Charles because I wanted to be able to wear the cowl for most of the year rather than just the cold weather. I totally fell in love with the linen and silk blend as I was working with it. I love the swing and the drape that results from the fabric you create. It is kind of funny because some 300+ ravelers have made it to date and few have used something other than wool. 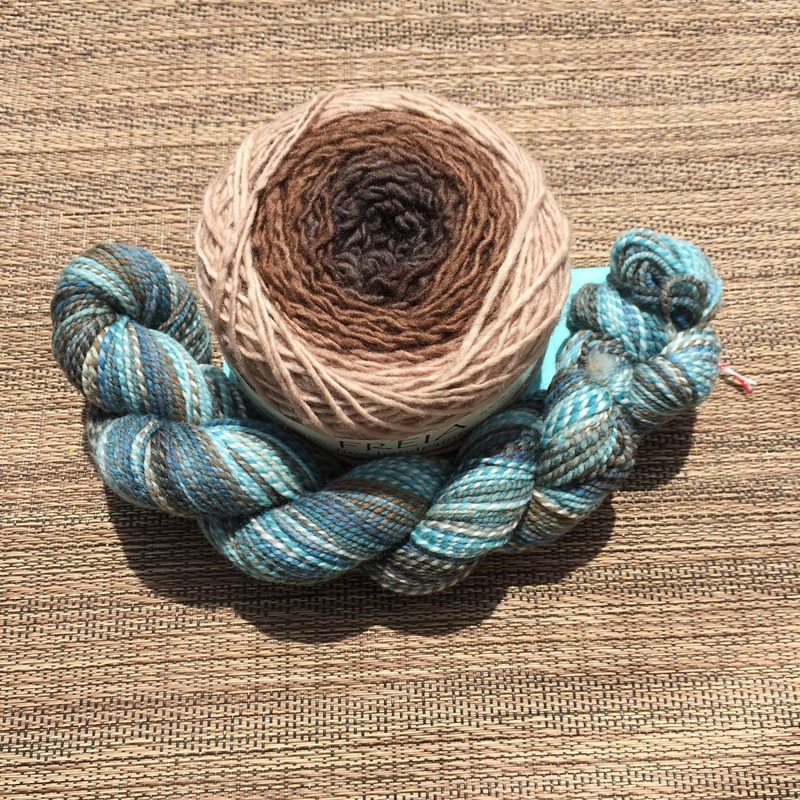 Yarn substitution is often a bit of a challenge if you start to actually consider factors other than gauge. In this case I am thrilled with the results and encourage you to venture into something not "so wooly" as you work on projects this summer. That's right I said "Blame it on my mom". 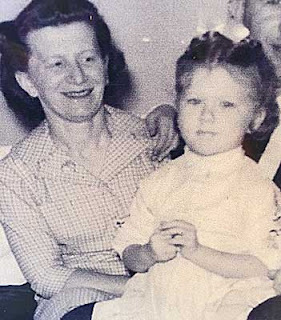 My mom's name was Veronica (Vroni) for short and she was a stay at home mom that never stopped. She taught me the saying "Good better best, never let it rest, until your good is better and your better is your best". She was an expert seamstress. We sewed amazing garments together. We sewed pieces that were fashion statements, blazers, coats we did it all. I learned fitting skills, the way fabrics acted based on their fiber content and most of all I learned how to create. I would fall in love with a fashion piece and we would analyze what made it special. It is this skill that transferred over to my knitting and crocheting skills. 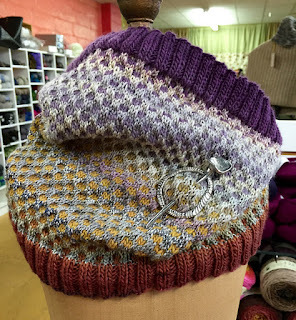 That ability to see drape and fit or think through how a specific yarn is going to act. She was so nervous when I decided to open the store. I will never forget her telling me that I should open the store with just a little bit of yarn and then grow into buying more. More than that I will never forget the day she started working with bamboo needles that we had at the store. My mom went out of her way to tell me how much more she enjoyed knitting with these needles....she was not an easy one to impress. I know many of you met her, she used to come in and help me when she could. She hated not having a task, so I would make up projects just to have her come hang with us.She loved people and people loved her back. Your better is your best.